Imagine living in the southern suburbs of Cape Town in the 1870s, where would you go for a day out and how would you get there? There were no cars and horses were expensive to keep unless you needed them for your business. Perhaps you knew someone with a horse and cart so, as a great treat you could go to Muizenberg beach. Then, in 1882, the railway was extended from Wynberg to Muizenberg and suddenly it became easy to have a day at the beach. In those days Fish Hoek was a farm in the country with a beautiful but remote beach. In 1883 the railway line reached Kalk Bay but it was not until 1890 that it was extended to Simon’s Town passing along Fish Hoek beach. The owners of the farm, having seen Muizenberg become a fashionable resort after the arrival of the railway, could not have been pleased when the railway authorities wanted to purchase land for the line but they could not refuse. A station was built opposite what is now Windsor Lodge. This was just a wooden platform with no shelter from the south easter and it was not until about 1910, after many complaints from travellers that a small waiting room was built at each end of the platform. 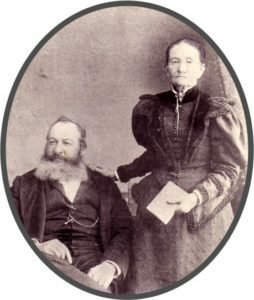 At that time the owner of the Fish Hoek Farm was Hester de Villiers who lived in the farmhouse, on the site of the present Homestead Naval Mess, with her husband Izaak de Villiers. She had bought the farm in 1883. She was then fifty one years old, a teacher who, with her sister, had run a small school in Cape Town. For an unmarried lady of her age to buy property was very unusual, but she came to Fish Hoek and ran the farm on her own. At the age of sixty nine she married Jacob Izaak de Villiers who had a farm at Noordhoek. He left one of his sons to run his farm and came to run the Fish Hoek Farm with her. Previous owners of the farm had mainly wanted it for the fishing rights, but Hester de Kock, as she was then, cultivated fields of wheat and vegetables and it was probably Hester who built the barn, now Mountain View cottages, this is the oldest building in Fish Hoek. As the farm expanded more water was needed so in 1902 she bought the water rights to the Kleintuin spring at Clovelly and pipes were laid to bring the water to Fish Hoek to irrigate the fields and supply the farmhouse. The first official grant of land at Fish Hoek was made in 1818, by Lord Charles Somerset. One of the stipulations in that grant was that the beach should remain open to the public but as it was not easy to access the number of visitors was small. However, the building of the railway line changed that. It was now easy for the citizens of Cape Town to get on the train to Simon’s Town, get off at the Fish Hoek station, and walk, and perhaps picnic, on the beach. Izaak de Villiers kept a strict eye on them, any rowdy behaviour or leaving of litter and they would be immediately reprimanded. Talking to visitors it soon became obvious that many of them would like to be able to stay in the area. So Hester de Villiers started letting rooms in the farmhouse and, when this became popular converted the barn and the coach house to rooms. Uitkyk, the building on the site of the old whaling station, was converted to a holiday cottage and camping was allowed next to the barn. So it was that Hester de Villiers became our first Fish Hoek tourist entrepreneur. Having no children of her own it seems that Hester had come to regard the eight children of Izaak’s first marriage as her own. In her will she left the farm to her husband but asked that on his death the land should be sold and the proceeds divided equally between all her step children but the farmhouse was left to her two step daughters. She left a sum of £150 “to be placed in the savings bank at Cape Town and used for the maintenance of the family cemetery”. She died in 1914 and Izaak in 1916. They are both, with other members of the family, buried in the family cemetery which is now beside the Dutch Reformed church in Fish Hoek, whose members look after it.